Until my flight today, when the cabin pressure may have been tweaked to make me imagine what I experienced on my PSP, the oddest basketball video game I'd encountered was from Square-Enix, featuring Super Mario. That one now seems plain. It turns out, I've been blind to the madness that is Sony's portable NBA games. I had assumed that they are mere basketball simulations. On my flight, you see, I just failed to defend the city of Los Angeles from two midget Phoenix Suns basketball players, despite my command of four giant-sized Los Angeles Lakers. I was defeated. California's top players stood helpless as their yellow uniforms turned purple and gray. L.A. fell, conquered. At least I'd put up a better fight against the Suns than I had against the B-Ball Bot, a robot that had trash-talked me as I played one of NBA 10: The Inside's many odd modes: Robot pinball. Through a robotic voice-over the Bot had informed me that it was "the greatest basketball playing robot ever made," and told me "Mankind reached its peak with my creation ...your fingers are no match for my gears." 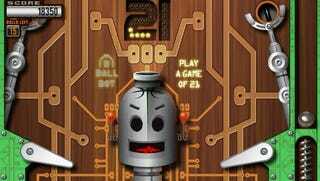 The robot was part of NBA 10: The Inside's odd pinball modes. The midgets vs. giants stuff was part of what I believe might be the world's only amalgamation of basketball, Risk and Advance Wars. This early October game is one of the oddest things I've played in a while. I like that, though I am dismayed that I somehow missed that the robot pinball was also in last year's game. So were the quest modes, though the ability to storm the nation, strategically, as a dodgeball team rather than a basketball one is indeed new. We ran a story recently about how many avid gamers dismiss sports games. Our Luke Plunkett argued that even traditional sports games offer pleasures that gamers of non-sports games would enjoy. You didn't all already know that Sony's NBA games were this stuffed with odd and interesting gameplay, did you? Am I the only one who was unaware? As I mentioned above, the game includes B-Ball Bot, a board based on a basketball-playing robot that has funny trash-talking robot voice-overs. NBA 10: The Inside also includes more standard boards, all played with the PSP's shoulder buttons as the flippers. The view of the board scrolls up and down to enable the player to follow the action. One pinball board, called Away Game, is based on the stages of prepping for a game on the road, offering players the challenge to knock down barriers to sleep, sink a ball in the airplane check-in pocket and more. It is amplified with sound effects like suitcase zippers zipping, yawns and airplane boarding bleeps and bloops. I believe this was all in last year's game, but it's new to me. Robot pinball too pedestrian for you? Block a Shot turns the PSP into a Whack-a-Mole device, as items pop on screen in locations that match the placement of the up, left and down buttons on the PSPs d-pad, as well as three of the machine's face buttons. The player wants to whack back down any standard orange basketballs that pop up, repeatedly whack (dribble) any tri-color basketballs, not hit whistles lest they get called for a foul, whack teammate jerseys in the order of their numbers, hold a button and release when slam-dunk items pop up and — one more — hit the shot clock item when it shows up lest the whole round be disqualified. Oh, and you can call for timeouts. Yes, of course there are also 10-frame bowling (new this year), Skee-ball and Puzzle Bobble-style (also new) mini-games in NBA 10: The Inside. There's also this cleverly-named Breakout or Arkanoid clone, Shootin' Bricks (not new, I've learned) that lets you tilt your paddle, use power-ups and deal with a ball that moves faster and faster as the shot clock continues to expire and reset. There's a the vertical-PSP modes (more hold-overs) which offer another bowling variation with the lane stretching the length of the PSP, because, well… this is what Sony does with their portable NBA games. They've had dodgeball simulations in NBA games before. And maybe they've had rebounding challenges in which you place bets on how many points your player or a computer-controlled player can score with balls being shot and ricocheted off a backboard in a half-court. Still, I must ask, how did I miss that this series has been offering a Risk-style basketball strategy game that involves converting every NBA player in the league to your team and taking control of every major city in the continental U.S.? Thank goodness, they now let you play dodgeball during this mode in the new game. All of NBA 10: The Inside's new or returning Conquest modes are turn-based strategy games set on a map of the U.S., with sporting events used to determine whether attacks and defenses of a city fail. Standard Conquest mode lets a player use their five-man squad to challenge adjacent cities. Beating the rival squad brings all the rival players onto the player's roster, adds a new city under your control and lets you expand further. Failed attacks cost your team a player. Cities can be upgraded; players can be improved. The new Dodgequest does all that with dodgeball. The new GiveandGoQuest does all that but applies multipliers to a team's scoring for each pass they make during a possession in a challenge. My favorite of the quests I sampled was Elimiquest, which debuted in last year's game. This one allows five-on-five challenges, but deems that the victor is the team that can first whittle itself down to one player. Any player who scores six points is eliminated. The elimination of that player awards the rest of the team with a power-up, a better power-up if the player was an inferior member of the roster. When the Suns' star Steve Nash was the first to be eliminated against my Lakers squad, his team got nothing. When a lesser player was eliminated, the remaining three players were turned into giants. Thankfully, I still had five players and was able to use my numbers advantage to score and get a couple of my guys out of there. At one point I had three giants Lakers with infinite speed boosts (thanks to the "Pure Turbonium" power-up) playing against two highly maneuverable midget Suns. The Suns won the match, claimed my players and took over my city. I lost. The game isn't all strangeness. It also contains a full and serious basketball offering which appears to have all the standard trappings: The teams, the players, the venues, the full season, the announce team and so on. Another blindspot has been filled. Sony, I had no idea your NBA team was so.... creative. And that's your object lesson for the day about why not to ignore sports games.